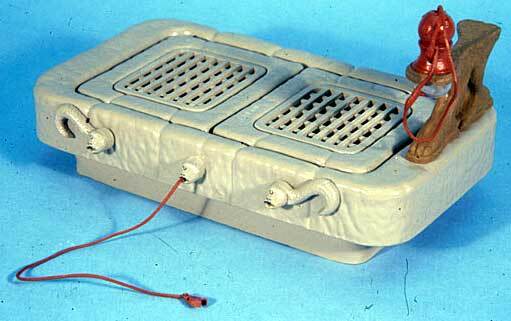 These Kenner file photographs show a hand-made conceptual prototype of the Jabba the Hutt figure and playset. As you can probably tell, most of the elements of the finished toy are included in this early example, though they appear in very preliminary forms. The platform, slave chain and pipe thingie are all here; about the only thing missing from the set is the small Salacious Crumb figure. In this first photo you see the complete set. The photographer used the original Leia figure to demonstrate the slave chain. 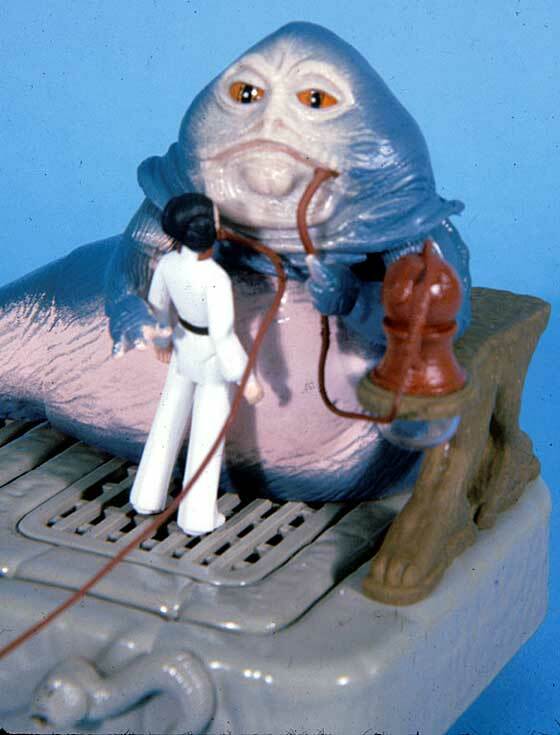 This next shot is a close-up of Jabba, who seems to be slavering over his prisoner. Notice the detail in Jabba's head. It's likely a painted urethane casting. The body, which features a segmented tail portion, also looks as though it's made of resin. 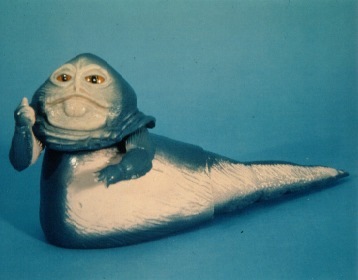 Similar bodies have surfaced in a soft vinyl material and lacking the segmented tail, suggesting that Kenner considered several different materials and forms for the toy. Another close-up of Jabba, sucking on his pipe. This version of the set was supposed to come with frogs for the hideous gangster to snack on. 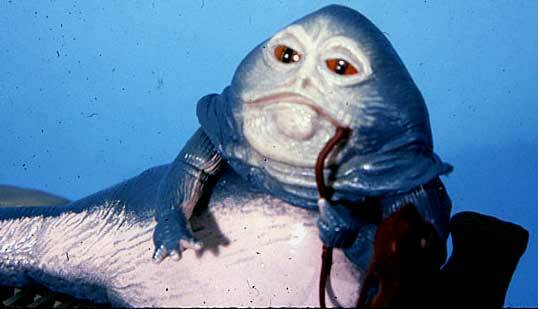 Jabba, doing his impression of the Fonz. Here we have a nice shot of of the throne. It looks like a cruder version of the production item. Keep in mind that this entire thing was likely fashioned by model makers, out of hand-worked materials. No doubt about it, this is a tremendously interesting prototype piece. Unfortunately, it's never surfaced. 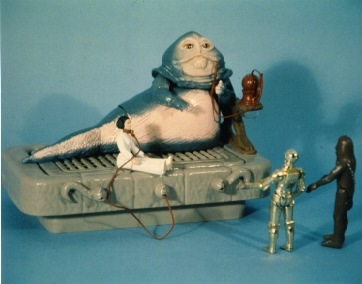 However, several conceptual parts of this early Jabba figure have entered collections, some of which can be seen here.